I first want to thank Jake for letting me use him as my guinea pig for this room series. I have decided to do a series to document the individuals around me who have chosen to decorate and customize their room to best fit their needs. I’ve chosen this time period and demographic because I think this window between high school and marriage is one of the few gaps where an individual has complete freedom to do as they like to the place they come back to every night. Through this series I hope to discover the range of characters who have decided to reinvent their bedroom and how they've gone about doing so. 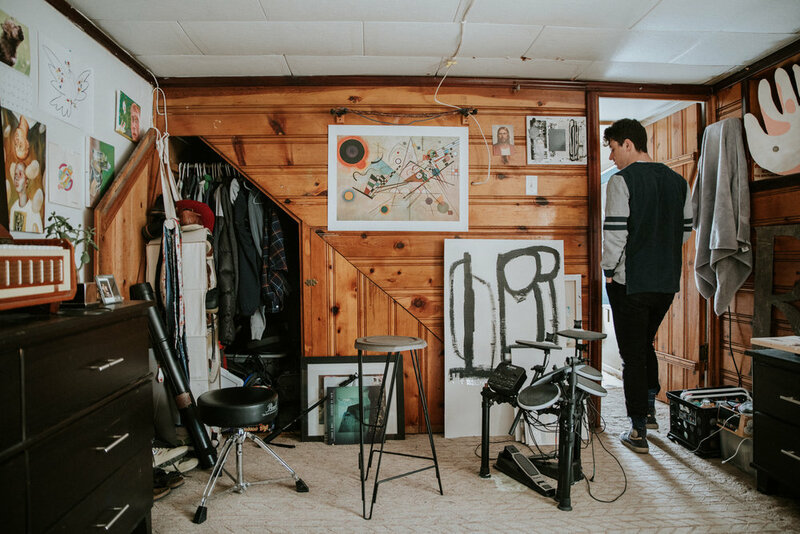 Dried paint, constant "it's messy" apologies and a soft smell of wet ink fill the corner Mr.Jake Reedy occupies in the renown Hashtag House. At the bottom right of a narrow set of stairs is Jake's single room which he has filled to its capacity. Adding up all his projects and sketches, I quickly realize I wouldn't be surprised if the next Banksy or Rothko came out of the basement of this white paneled house . 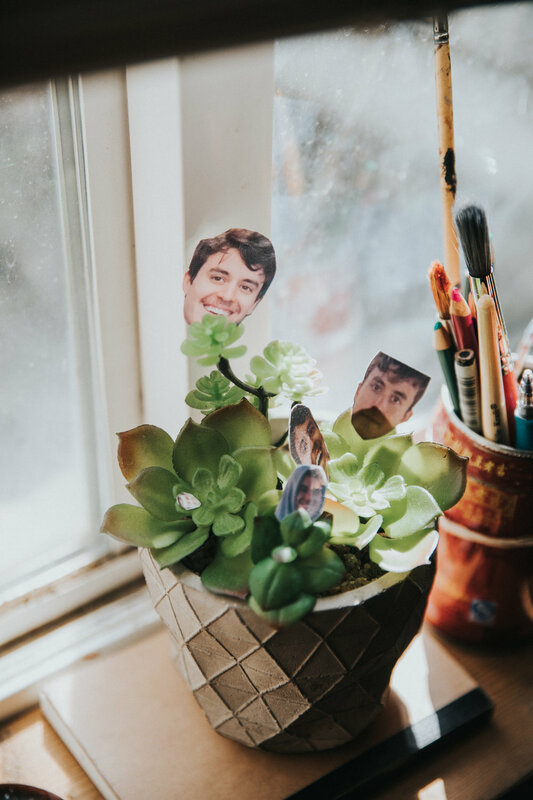 As I do a few laps around the room, I realized a factor that is so distinct and compelling about SaltLakeJake; he has the overlooked attribute of creating something bigger than himself. Whether that overused artistic term means physically or mentally, I think it perfectly describes Jake. A lot of people doodle, even more like to do cute watercolor but having an itching vision and being able to project it on an absolute massive scale is beyond incredible. Humble is a understatement for Jake for if you ask him what he likes to do he’ll simple say “just make stuff”. As we skim past small talk, he happily and proudly blurts out the effort he made to shave his two week deep ginger tinted beard. He states he feels naked as a baby but I feel the fresh shave is reflective to the newly cleaned room he has tidied up just for me. The only instructions I gave him going into this new project was to have a clean room and a few objects in mind that illustrate you. I also said to wear the most "Jake" outfit he could find and to my prediction he represented his well worn in navy Diesel sneakers as well as a broken in, off-black sweatshirt with baseball lines up the sleeves. I tell him to take a sit in his desk that we have seen oh so many times on Snapchat. His light, tan wood bed is installed with a small desk just off the headboard and though from first glance it seems miniature and juvenile, Jake quickly claims it as his favorite place to sketch. 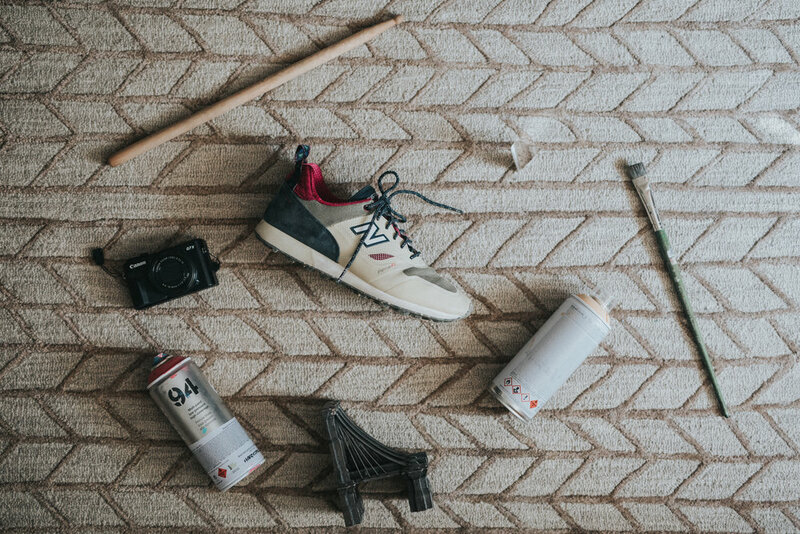 There are many different objects in Jake’s room that sum up his ability to create as well as his ability to surround himself with visionary people such as the numerous drawers and baskets of spray paint canisters, a succulent with his face pinned on every leaf and a well framed cross stitch portrait given as a belated birthday gift. I haven’t seen Alice in Wonderland in twelve years but somehow I feel like i’ve just been placed in it right next to the Cheshire Cat. It’s a mystical room where you seem to see something different every time you visit which makes it a refreshing, innovative place to be. To me Jake is a complete mix and compilation of his New York City/Chicago experience, 10,000 hours of dedicated work and role as the oldest boy in a family of all girls. Each piece has it’s place and purpose yet somehow it’s a designed, structured blend of madness. Jake’s mind is always moving and so is his room. He’s made a 12 ft by 12ft space more than just a place he can “make stuff”. He doesn’t have his mom telling him not to paint on the carpet and there isn’t a roommate or spouse complaining about the long hours at the desk. Jake has taken full advantage of this freedom in his life and I look forward to see what he does with his career as well as the building and aesthetic of his future home. There are almost no restrictions and precautions with a room for someone in this time and I hope to continue to see and document what people have chosen to do with this privilege.